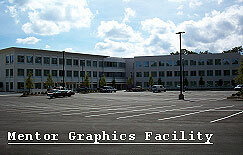 Mentor Graphics Facility - HHB Engineers P.C. Scope: The new facility was a joint venture between the University of South Alabama and Mentor Graphics, a software industry concern. The building is a 3-story 80,000 square foot concrete structure. The facility houses, for the most part, administrative offices clustered around Information Technology (IT) Labs. Each of the offices, as well as the labs, has provisions for heavy IT connectability and dense computer usage. The facility includes a state-of-the-art Building Automative System (BAS) which integrates HVAC controls, lighting controls, building load management, and building alarm functions, all under one centralized system. 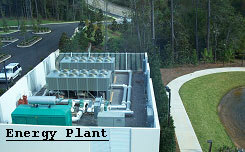 The building was fully protected with a fire suppression sprinkler system and had back-up power generation capabilities. The central mainframe computer room has separate precision air conditioning, pre-action fire protection, and U.P.S. with full back-up power provisions. Hattemer, Hornsby & Bailey (HHB) served as the Mechanical, Electrical, Plumbing, Design and Fire Protection Engineering consultants including Construction Period Services and was responsible for all aspects of the new HVAC system electrical systems, fire detection & alarm systems, plumbing and fire protection systems.